The view of the 405 this afternoon looking north from Sunset Boulevard. Photo by Carter Rubin/Metro. Just a reminder: the free service Metro is providing on the subway, Orange Line and select bus lines continues on Sunday to help people get around during the 405 closure. 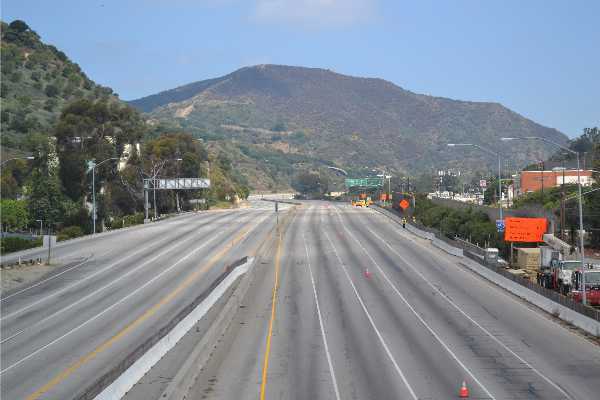 Here’s a lengthy post explaining where you can find the free service, which is intended to help connect the San Fernando Valley to the Westside with the 405 out of commission while work continues tearing down the south side of the Mulholland Drive Bridge. Also, if you’re having a slow Saturday night or you and your honey are really into the art of demolition — to each his own, I say — here’s the live video feed of crews working on the bridge.